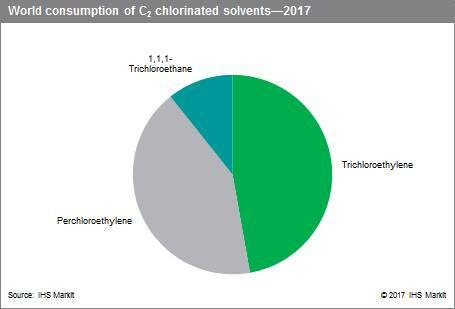 The C2 chlorinated solvents that have major commercial significance are perchloroethylene (PCE), trichloroethylene (TCE), and 1,1,1-trichloroethane (TCA) or methyl chloroform. Consumption of these solvents has been negatively impacted by declines in emissive applications as a result of regulations related to the 1987 Montreal Protocol on ozonedepleting chemicals and the 1997 Kyoto Protocol on global warming and climate change. Use of TCA has been phased out since 1 January 1996 in most countries because of its ozone depletion potential (ODP) in the upper atmosphere. Consequently, global consumption of all three solvents is now heavily dependent on use as a feedstock in the production of fluorocarbons. Over the past two decades, the global fluorocarbons market has undergone a number of major transitions toward a greater use of non-ozone-depleting hydrofluorocarbons (HFCs) and non-global-warming, nonfluorocarbon alternatives in emissive applications. Consumption in the largest market segment, refrigeration and air conditioning, was negatively impacted by the Montreal Protocol and Kyoto Protocol amendments and legislations and there are current and proposed regulations limiting the future production, consumption, and trade of chlorofluorocarbons (CFCs), hydrochlorofluorocarbons (HCFCs), and HFCs. In 2017, China was the largest consumer of TCE, accounting for 58% of total world demand, followed by the United States at 19%, Japan at 6% and Western Europe at 5%. In June 2014, the US EPA concluded in an assessment that TCE poses health risks to workers and consumers. Workers in small commercial shops that use TCE as a degreaser, those that use TCE as a stain remover in dry cleaners, and consumers who use spray aerosol degreasers and protective coating sprays for arts and crafts, are especially at risk. In 2017, China accounted for approximately 40% of total world demand for PCE, followed by the United States at 37% and Western Europe at almost 9%. Chinese PCE consumption is projected to experience the highest average annual growth rate among major consumers, at about 3.4%, during 2017–22. In fact, all other countries will experience a decline or only modest growth during the forecast period. In July 2014, the US EPA proposed a rule under SNAP (Significant New Alternatives Policy) to ban the use of several HFCs (including HFC-134a, HFC-125, and HFC-containing blends) that were previously listed as acceptable alternatives to ozone-depleting substances. SNAP regulations, beginning in 2016, will hamper growth in PCE consumption for HFC-134a and HFC-125. Chinese consumption of TCE is forecast to grow at an average annual rate of nearly 4%, driven by its use in the production of HFC-134a. Most other countries or regions will experience a decline (primarily Japan and Western Europe) or modest growth. World consumption of TCE is forecast to grow at an average annual rate of nearly 2% during 2017–22. World consumption of TCA is forecast to decline at nearly 1% annually during 2017–22. In 2017, the United States accounted for 65% of total world demand, with Western Europe accounting for 35%. In 1987, the leading applications of TCA were for use as a solvent for adhesives, in metal degreasing, and in the manufacture of vinylidene chloride. All nonessential emissive uses of TCA were phased out in 2000. Most of the current consumption of TCA is for the production of HCFC-142b, with lesser amounts used for HFC-143a and HCFC-141b. The phaseout of HCFCs began on 1 January 2010 (except for equipment manufactured prior to that date), followed by a complete ban on usage by 2020. Over the next five years, global demand for PCE is projected to increase at nearly 1% annually and demand for TCE at nearly 2%, while TCA is forecast to decline at nearly 1% per year. China is projected to have the highest average annual growth rates for PCE and TCE, while Japan is projected to have the largest average annual decline for TCE and PCE during 2017–22.